Granite is a very common intrusive igneous rock. It is coarse and is made of the minerals feldspar, quartz and biotite & muscovite mica. It’s also known to have a very high silica content. Just like limestone granite is available in a multitude of sizes, screenings, #4, #5, #57, #67, #89 and a variety of other sizes. The name granite is derived from the Latin word granum, which means grain, an obvious reference to the granular texture of granite. Most of the granite brought into Florida is light gray to dark gray. Some of the granite for decorative landscaping uses is white. Granite is easily recognizable by the sparkles that are seen on the raw material. 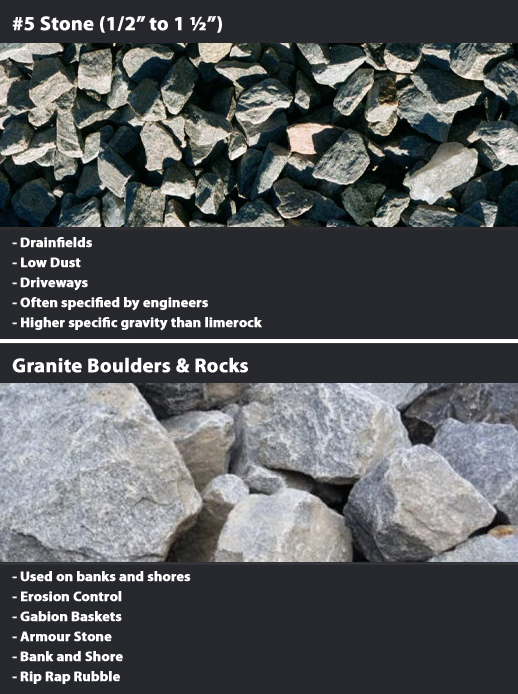 Granite is often used for landfill leaching. A popular granite used in conjunction with (ADA) Americans with Diabilities Act projects is our Decomposed Granite. It’s a naturally occuring material that starts out as a solid and over time is broken down. The size of decomposed granite is 1/4″ minus with fines included. This size compacts well and it creates a firm surface yet allows water to permeate. Many projects that are required to meet (ADA) standards require this material for walkways, paths and more. The basic concept is that you place it, water it then when you compact it the material basically locks in. Common language used by engineers on water type of projects is as follows: material shall be free of cracks, soft seams or other structural defects. The pieces shall be roughly angular, and the lot shall be reasonably free of thin, flat or elongated pieces. Engineers often require the Decomposed Granite on many (ADA) projects. Granite is abundant and easily accessible although bringing it to Florida occurs by either barging into one of the ports or via railroad cars.